Most plants rely on the seed as the primary method of reproduction. 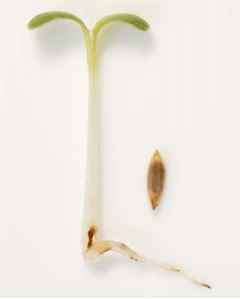 The seed is formed inside the female flower after pollination by the male flower. All seeds begin as an egg within the carpel of a female flower. After male pollen is introduced to the female flower by wind or insects, the egg becomes an embryo and forms a hard coating around itself. When seed development finally stops, the seed is released and it is carried by wind, rain, bird or bug to its final resting place. If all conditions are right, it will become a new plant and repeat the growth cycle process. If you plan to grow indoors, you may need to "play bee" and manually pollinate your flowers for them to bear fruit or seed if they are not of the self-pollenating greenhouse variety. With peppers and tomatoes, I simply "tickle" the open flowers with a soft artist brush to spread the pollen from flower to flower. It still amazes me that such a tiny, benign looking object can sprout forth food for the planet and in return require only a little light and water. Tools of the trade - 10" x 20" flat w/ 6" clear humidity dome and electric heat to speed up the process of germination and rooting cuttings. Below, a simple light meter can help you evenly distribute illumination for optimal growth. perlite work well too, although I've heard there may be safety issues with vermiculite due to intermingled asbestos fibers. The Perfect Starts sponges are made from organic compost that is molded into small plugs with a flexible binder maintains there sponge like texture and shape. 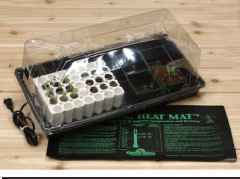 This allows the hydroponic grower to use an organic medium for seeds and cuttings that can be transplanted directly into any type of system. The sponges protect the roots and keep the material from clogging spray heads. 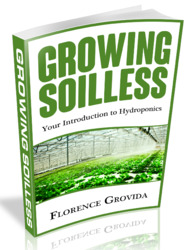 See the chapter on hydroponic mediums for more information. Avoid using soil to start your seeds because it is not sterile and may contain pests or pathogens that can infect your system. Water your starting medium with a 1/2 strength nutrient solution before use and keep it moist but not soaked while seeds or cuttings root. If you are using coco coir, it comes in dehydrated bricks that can be soaked in the 1/2 strength nutrient solution during the re-hydration process. 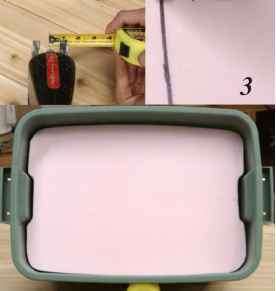 See the chapter on growing mediums for more information on re-hydrating One brick usually makes about two gallons of loose coco coir, so you may not want to use the entire brick at once unless you have a lot of seeds to start.